Can a Cat and Dog happily coexisting together? Though we only sell dogs in our stores, we are animal lovers in general! We recognize that our furry friends won’t stay with us forever and that they’ll be joining a new home before we know it! Our furry babies will be going to various types of homes and in each case, we want the very best and we especially wish for smooth transitions. For instance, if you purchase one of our miniature Schnauzer puppies for sale and plan to take him home to where you currently have a cat, we want you to know how to introduce them. Take a look at our three tips for introducing your cat and dog. If possible, please make arrangements so that the current resident animal isn’t in the same room when the new addition comes the first time. Upon bringing your new pup home, allow him to take a supervised tour of the house. He will certainly smell the other animal that lives there. Joining a new home is already a stressful situation for your pup, so the introduction should start with their scents getting acclimated to the other. After the tour, let your pup approach the threshold where he can smell the cat’s scent and vice versa. This way, both animals can smell but not see each other. Watch his body language for levels of excitability or angst. If your pup is calm, award him with praise and treats. If he cries, barks, or scratches at the door, work with him to distract his focus with a training session or meal time. Do not move to step two until your pup isn’t focused or obsessed with the door. Miniature Schnauzer puppies for sale are little gems that people bring into their homes and hopefully, your feline family member will feel the same. In this next step, take your time. How long your pets stay separated behind the door really depends on how they have reacted to each other. Only when they’re both relaxed do we recommend that they are physically introduced. Use a gate to separate them but allow them to see each other. When both parties seem relatively relaxed (a little excited is okay), move them to an area where they can see each other, but there’s still separation. A gate or screen door will work best. If you have an extra pair of hands, have a friend or family member help you. Pay close attention to their body language again. Expect them both to be a bit excited, because that’s normal. Attempt to get your dog to look at you and occasionally divert his attention from the cat. If this happens, praise him! Next, allow them to move closer to each other. This step takes time so you must do it slowly. You want your pup to focus primarily on you and not the cat. During this last step, you will remove the gate or whatever physical barrier you’ve inserted. Miniature Schnauzer puppies are highly trainable so hopefully, this won’t be a difficult last task. 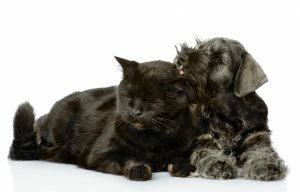 Now is the time to put a leash on one of the newly purchased miniature Schnauzer puppies for sale you’ve purchased and let him approach the cat. Ideally, their little whiskers will meet each other. Again, watch their body language. If you see any signs of aggression, separate them. It’s normal that both will have some type of response. When they are calm, praise them both with treats and positive words. This will take a few days for them to become fully used to each other. With your patience and diligence, you’ll have a cat and dog happily coexisting under one roof!